An animated version of this graphic novel was released in 2012. See the trailer here. In July of 2016 this book was re-released with a cover new image (and in hardcover for the first time) by Fantagraphics. I highly recommend this graphic novel that provides a look at assisted living and Alzheimer’s patients. I enjoyed the realistically drawn images, colors, pacing, and dialogue. Without any narration, this work provides an excellent, moving, and poignant tale of having a parent move into an assisted living facility. The book also portrays life in that environment. While in the well-run facility, we get to know many eccentric characters. The only shortcoming that I found in this book is that the assisted living facility is so well run, the reader isn’t shown any examples of poorly staffed or low quality facilities. Perhaps this is a difference we see more commonly in the U.S., as this book is based on experiences in Spain. 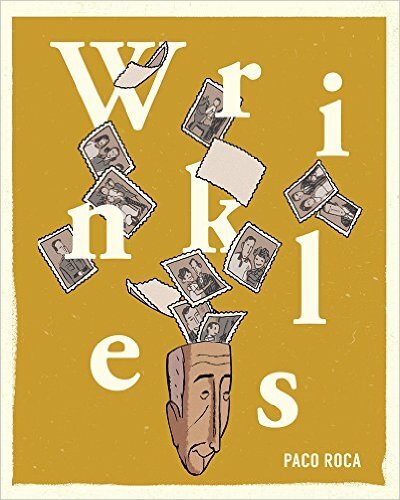 If you don’t want to be given any details about this graphic novel, I would quit reading this review and acquire and read Wrinkles without being tainted by some of the reveals I provide herein. In the facility Emilio meets a man who repeats everything said to him; rooms with Miguel who’s always trying to make a buck off the residents, including Emilio, by taking advantage of their memory difficulties; encounters a woman always wanting to make an unmade phone call to her children; is shown Mrs. Rasario who believes she’s elegantly coiffed and traveling to Istanbul on the Orient Express; among many others. Miguel explains the first floor houses the healthy ones who can care for themselves while the second floor’s where “the incompetent live [Miguel’s words],” those who can’t manage, having Alzheimer’s or dementia. Later Emilio tries to hide his difficulty finding the dining room as being new to the home. A few events that occur around Emilio are: Personal items disappear from where he says he put them, calisthenics Wednesday, bingo, a wall clock in the morning and afternoon being more active than a room of seniors, and a touching but horror-stricken tale of Miguel secretly providing a puppy to a resident. The reader can find who-done-it speculation, humor, disbelief, sadness and many more emotions throughout Wrinkles. Rarely are there visits from family members, perhaps only at Christmas. Emilio asks Miguel if he has visitors and Miguel responds, “I never married and I don’t have children—that I know of. And seeing what I see here, I don’t regret it. I’m no more alone than those who do have children.” There’s a very poignant scene, explained by Miguel, between a woman who doesn’t remember her husband, a male stranger she met in the home that she latched onto and her actual husband who’s “resigned” to the situation. Emilio has an upsetting epiphany when he learns he’s taking the same medications as a resident who says nothing and no longer recognizes his wife who spoon feeds him. This leads to the one medical lesson provided by the home’s doctor who explains Alzheimer’s and dementia to Emilio, who’s in its early stages. Emilio feels compelled to see the second floor only to retreat after finding some of the residents there. Miguel teaches Emilio to fool the nurses to avoid being sent to the second floor. One of the most touching moments occurs between Dolores and Modesto; where one word from Dolores brings Modesto a remembrance and a smile. Miguel attempts to escape with Emilio by getting a car only to have some of Miguel’s activities squelched by staff. And Miguel learns it’s dangerous to give a requested monkey wrench to a fellow resident. Miguel creates messes and does fix some of them. If we live long enough our deterioration is inevitable. Wrinkles provides a window into how that process can bring sadness, fun, and nothingness to the forefront.